If you are parenting a baby who is close to that sit-to-stand-to-walking stage, then listen up! The products you choose to use, or not, can heavily impact your baby's proper growth and motor development. Currently there are no good product choices that emphasize helping children learn how to move from sitting to standing, and progress to walking. There are the seated walkers/bouncers but these devices limit a child’s natural movements and restrict their ability to move through all planes of motion. Additionally, these products have been known to cause hip dysplasia and can actually delay achievement of the developmental motor milestones. The other primary category of walkers includes those with handlebars and wheels. However, a child at this stage of development lacks the ability, strength, or coordination to independently reach up, grasp the handle bar and move to a standing position. Subsequently, parents tend to place the child in the standing position, which essentially eliminates the practice opportunity to work on their transition skill of moving from a sitting to standing poison. With the child up and holding onto the push bar he or she attempts to walk, however, the wheels on these products move faster than what a child can control. Children at this age do not understand to let go of the handle when they feel unstable; the body actually passes the opposite message. This sensory misperception convinces them that they are holding on to a stabilizing object, and subsequently they grip harder in an attempt to balance. Unfortunately, this often results with the child face first in the ground as the walker rolls away. As a practicing Physical Therapist and mother of two, I knew there had to be a safer and more natural way for children to learn the gross and fine motor skills required to successfully transition through the developmental mile stones en route to walking. The simple, yet effective, design of the Little Balance Box™ creates a stable platform for the child to place their hands and forearms. This allows them to achieve the optimal alignment to promote development of balance and coordination. Furthermore, a child can freely access and engage, or disengage, the Little Balance Box™ from any angle or position, where as with other products, the child is seated and restricted. development, and enables a smooth transition across various and uneven floor surfaces. The Little Balance Box™ is eco-friendly! It is made from sustainable bamboo and is BPA and PVC free! Lastly, the Little Balance Box™ makes a great toddler table. At this age a child is beginning to participate in more tabletop activities. It is often difficult for them to transition on and off a chair to sit at a table. They tend to lose their balance and fall off or tip over the chair. 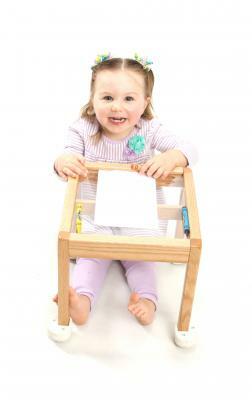 The Little Balance Box™ solves this problem by allowing the child to access the tabletop surface in sitting or standing. The clear top surface has a great workspace with the easy to clean top and rounded boarder to contain all the goodies! The children love having a place that they can independently access to work on their fine motor skills. As you can see the Little Balance Box™ is a new unique way to allow for optimum development in our children!! Check out this catchy video and Little Balance Box™ jingle! The Little Balance Box™ is also being featured on Kickstarter until February 28, 2015! Early Bird Specials of $20.00 off!! Check out this link for more details. To make a pre-order click on the green tab that says back this project. 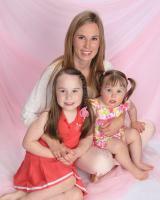 Shannon Davis PT, DPT, is the mother of two girls 5 and 2. She has earned her Doctorate and Masters degrees in Physical Therapy. Shannon is a MOVE ™ (Mobility Opportunities Via Experience) International Trainer for Adults and has been working for over 11 years providing specialized services to children and adults with developmental and intellectual disabilities in schools, day programs and home settings. She is the CEO of Inspiration Physical Therapy Inc., which provides therapy consultation services and Inspire Create LLC., the parent company of the Little Balance Box™. She is also a member of the CAADS (California Association of Adult Day Services) board of directors and participates in a variety of client advocacy at the local and state levels.